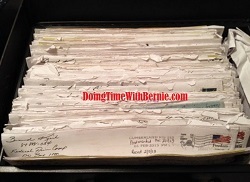 DoingTimeWithBernie.com: Liar Felon on Probation for lying to the White House Bernard Kerik pretends to visit the White House. Yes that happened. Liar Felon on Probation for lying to the White House Bernard Kerik pretends to visit the White House. Yes that happened. 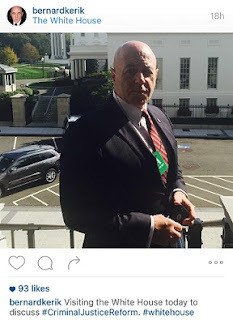 Liar Felon Kerik posts and boasts about visit to the White House??? He apparently lies about the White House again?? On Tuesday, October 13, 2015, corrupt cop, eight-time felon currently on federal probation, proudly posted this picture on his personal Instagram proudly proclaiming his “visit to the White House”. The picture shows the felon, who still owes $180,000 in criminal restitution to the country whose house he is allegedly “visiting”. Bernie Kerik is sporting a green "A" Badge denoting having an "appointment". Now isn’t this typical of Obama’s America. A libel-proof felon, currently on federal probation, who went to prison for LYING TO THE WHITEHOUSE is given the privilege of visiting the White House? This little charade was only posted this criminal’s personal Instagram account and not on his “verified” Twitter, Facebook or ACCJR.org page. Certainly any legitimate visit to the White House would be appropriate for his dark money “non-profit” ACCJR.org page! Well, let’s examine this “visit” more closely keeping in mind the poster is a proven liar and alleged psychopath. Felon Bernard Kerik is a liar. However, he’s not a very good liar. Bernard Kerik lies by omission. Bernard Kerik lives in the world of if he gives the appearance of and says it enough, it’s true. Bernard Kerik is dumb. Real Dumb. Bernard Kerik doesn’t check his facts. Bernard Kerik’s bravado and stupidity landed him in Federal Prison for three years with a CURRENT FEDERAL PROBATION THAT ENDS 10/15/2016! Felon Bernard Kerik forgot that all visits to the white house are now transparent posted on the White House website. According to the Secret Service, Bernard Kerik did NOT have a visit in the White House. According to the US Secret Service, apparently felon on probation, Bernard Kerik, took a meeting in the “Eisenhower” building which is NOT considered “visiting” the White House. The Eisenhower Executive Office Building is located next to the West Wing, and houses a majority of offices for White House staff. Bernard Kerik’s visit yesterday was similar to the Eisenhower Building 2-person meeting arranged by Molly Dillon Bernie Kerik had with Roy Austin on 02/09/15 most probably about Bernie’s dark money funneling criminal justice no-show "spokesman" job with his seedy “non-profit”, ACCJR.org. Well, playing semantics is as close as we’ll get to a speck of truth when dealing with the expressions of an alleged psychopath like Bernard Kerik. Now if we can just get felon on probation Bernard Kerik to visit the US Treasury to pay his tax bills for his tax cheating schemes. Or, better yet, the Federal court Southern District of New York to pay his criminal restitution would be worth a TRUTHFUL and REALISTIC Instagram post! Sorry, Bern. Busted. Again. Criminals on probation should not and won’t be invited to the White House! See Something. Say Something.